This is the place to start if you're looking for succulent information: Debra's dozen favorites, all hand-selected for skittish beginners. These easy-grow varieties are readily available and beautiful to look at. You'll soon gain confidence and want more of these fascinating "plants that drink responsibly." There are numerous varieties of succulents, but these are the most common and those you'll likely run across. The photo that accompanies each is one example; other species will likely look different. Rosettes typically resemble big, fleshy-petalled daisies. Colors include green, yellow and garnet. Leaves of Aeonium 'Sunburst' are striped with yellow or cream. Aeonium 'Zwartkop', another show-stopper, is magenta-black. There exist many hybrids (like the Aeonium urbicum hybrid shown here). Some species are shrub-forming; all produce rosettes at the tips of ever-lengthening stems. Frost tender. Want to see more of these fleshy succulents with flowerlike forms? Go to the Aeonium page. These rosette-shaped succulents are native to the Americas. There are dozens of species of agaves, including many that are small and well suited to growing in pots. Agave victoria-reginae is a favorite; it grows to the size of a soccer ball over time. With the notable exception of Agave attenuata, most agaves tolerate temperatures into the mid-20s F. And some---such as Agave parryi 'Truncata'---go much lower. Into plants that look like artichokes? Go to the Agave page. Dramatic flower spikes are hot hues of orange or yellow. The main bloom season is midwinter, but there are aloes of various species in bloom at any time of the year. Gel-filled, tapered and serrated leaves of many aloes form starfish-like rosettes. Species range from a few inches in diameter to tall trees. Aloe arborescens, a common garden plant throughout Southern California, is an excellent fire-retardant succulent for wildfire-prone areas. Frost-tender. This general category refers to succulents---usually from desert climates---with spines, which are modified leaves that radiate from central points (aureoles). Some are columnar, others round or have stems like ping-pong paddles. Small cacti suitable for pots have a huge following with collectors. Do consider using golden barrels in your succulent garden; they offer an amazing textural enhancement. Many but not all cacti tolerate some frost. Into edgy plants? You're not alone. Find out Why Cactus is Popular. There are two main forms: branching and stacked. Jade (Crassula ovata) shown here is quite common. Leaf colors include silvery gray, bright yellow, and variegated cream-and-green---sometimes with red margins. Use jades as mounding shrubs and grow stacked crassulas, which are great cascaders, in terraces and hanging baskets. Frost tender. See more of these super easy succs on the Crassula (jade) page. Those with tight rosettes tend to form hen-and-chicks clusters. Echeverias that resemble cabbages usually grow atop ever-lengthening stalks. Ruffled varieties are among the showiest of succulents. All are ideal for containers, in fact, I discourage people from growing echeverias in garden beds as the leaves are too easily marred. Echeveria subrigida is among those that tolerate a few degrees below freezing. Learn more at All About Echeverias: Succulent Roses That Last. This immense category includes many nonsucculent plants; all have in common a milky sap that can be irritating, even toxic. Columnar species such as Euphorbia ingens suggest statuesque cacti. Unlike cacti, which have satiny flowers, those of euphorbias are beadlike. Droll Euphorbia obesa is a spherical succulent plant with subtle herringbone stripes. Frost tender. Popular (and ironically named) Euphorbia tirucalli 'Sticks on Fire' is a top choice for succulent gardens used as fire breaks in wildfire-prone areas. These windowsill succulent plants, which seldom get larger than a softball, thrive indoors and do well in pots. I don't recommend growing them in the garden as they readily sunburn and might be stepped on. Besides, it's a shame not to enjoy them close-up. Haworthias are easily hybridized---a hobby enjoyed by enthusiasts worldwide. Among them is zebra plant, so named for its snazzy white stripes. Discover how and why haworthias make perfect Succulent Desk Buddies. See more than a dozen varieties of Haworthia on the Indoor Succulents page. Not to be confused with a succulent commonly called "ice plant" that's a problem in northern CA, these groundcover succulents have brilliant blooms. Few sights can compare to a hillside massed with ice-plant flowers. 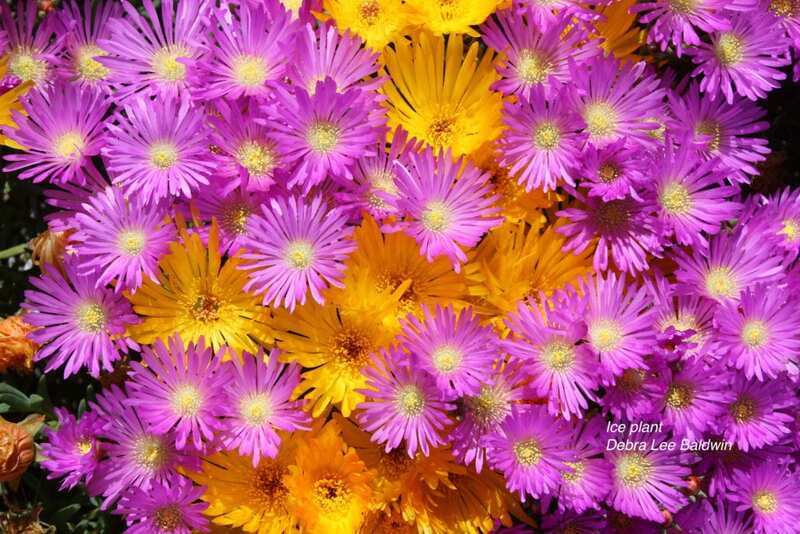 Ice plants need no mowing, require very little maintenance, and once established keep weeds at bay. Ice plants would make ideal lawn substitutes if they could tolerate foot traffic. But you can grow ice plants on steep, rocky slopes, something not possible with a lawn. See "Spring in My Succulent Garden: Flowers Wow with Bold, Hot Hues." These succulent plants are prized for their colorful or felted leaves and their flowers. Kalanchoes come in a variety of shapes and sizes. Most common is Kalanchoe blossfeldiana, which is sold in supermarkets; numerous hybrids produce long-lasting blooms in crayon colors. 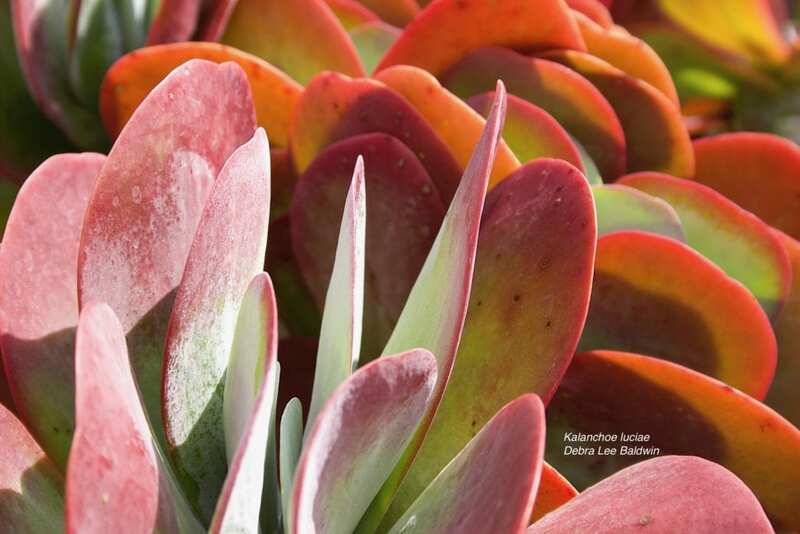 Surging in popularity is Kalanchoe luciae (shown here); its paddle-like leaves are sometimes wavy, and turn from teal to bright red when grown in full sun. Frost tender. Learn more: Should You Let Your Flapjack Plants Bloom? These trailing succulent plants with stacked and concentric or bean-shaped leaves produce masses of star-shaped blooms in summer. Plant sedums in rock gardens and use them as fillers for containers and as ground covers. Unlike other genera of succulent plants, most sedums (especially smaller ones) prefer cool summers and winters and tolerate temperatures well below freezing. Learn more about these and other succulents that don't freeze in winter at Cold Hardy Succulents for Northern Climates. Like sedums, sempervivums are cold-climate succulent plants; they don't do well outdoors in the heat of a Southwest summer. 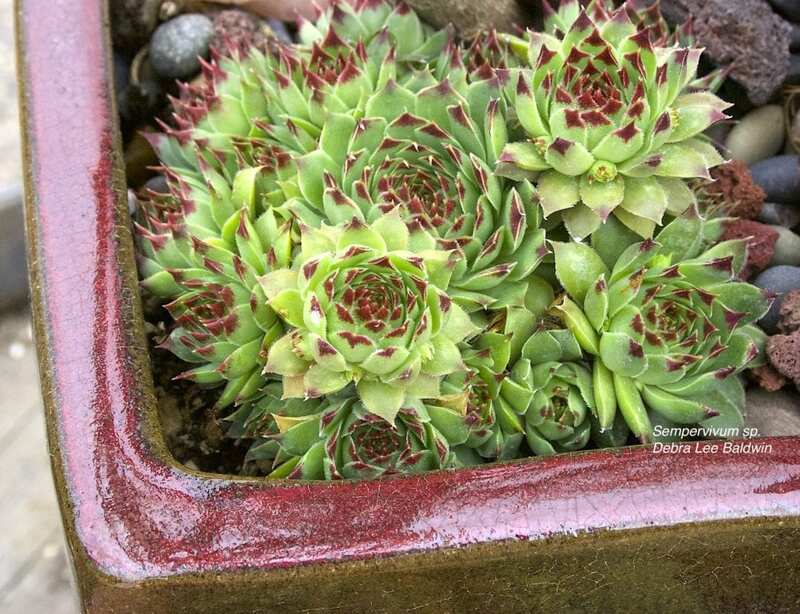 Semps resemble echeverias but have thinner, pointed leaves and a more compact, spherical form. Most produce offsets that create appealing clusters. Tuck sempervivums into the niches of a rock wall and let them overflow the openings of a strawberry jar. Frost-tolerant. Find out more in the article I wrote for the Wall Street Journal: Showy Succulents for Snowy Climates. Groundcovers Senecio mandraliscae and Senecio serpens (above) form drifts of blue and are striking juxtaposed with red- and orange-leaved succulent plants (such as Aloe cameronii or Euphorbia tirucalli 'Sticks on Fire'). 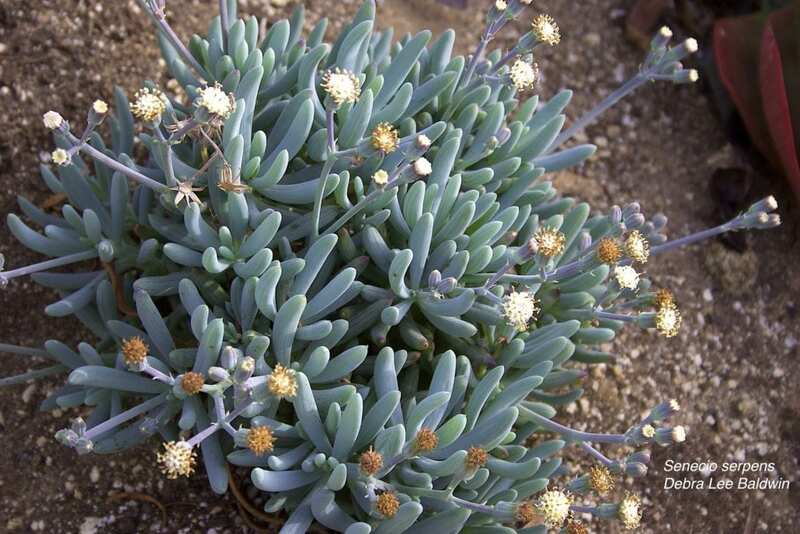 Let Senecio rowleyanus (string of pearls), which has pea-like leaves, cascade from a dry fountain or birdbath; it'll suggest droplets of water. Most senecios will tolerate a few degrees below freezing. Learn more about senecios and their many design uses in my books.